For voters upset with President Donald Trump, 2018 represented their first opportunity to rebuke him in a national election. Although they did not reclaim the Senate, the Democrats swept to an easy majority in the House of Representatives in elections this month. With Democratic voters turning out in high numbers across the country, that had a trickle-down effect on local races. Nassau County Republican Party Chairman Joseph Cairo said the anti-Trump turnout hurt the party’s performance in all races and led to Republicans losing control of the state Senate. Cairo did not criticize the president, who earlier this year tapped Cairo’s predecessor, Joseph Mondello, to become the U.S. ambassador to Trinidad and Tobago. The tax cut pushed by Trump put a cap on state and local tax deductions, which has adversely impacted states with high local taxes, such as New York and California. Republican candidates for Congress Dan DeBono and Ameer Benno — who were defeated by Reps. Tom Suozzi (D-Glen Cove) and Kathleen Rice (D-Garden City), respectively — would not wholly endorse the tax cut due to that provision. Trump lost Nassau County in 2016 by 332,154 to 292,025, or about 51 to 45 percent. A Republican presidential candidate has not won the county since George H.W. Bush in 1988, and the voter enrollment numbers make that look even less likely going forward. Since 1998, the number of registered Republican voters in Nassau has dropped from nearly 380,000 to 331,431 in 2018, according to the state Board of Elections. Over that same period, the number of registered Democrats has increased by more than 46 percent, up to 401,196 on the eve of this year’s election. 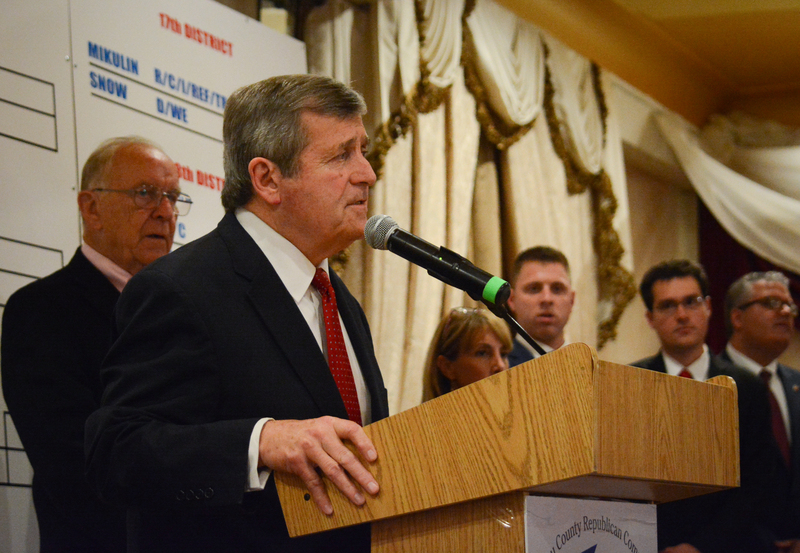 When asked about the Republican Party losing its grip on Nassau, Cairo said the party had to do a better job getting its message out and do more to appeal to independent voters, of which the county had 246,864 in 2018. With no presidential or congressional elections in 2019, Cairo sees the upcoming election as a chance to turn the focus back to local issues. “Taxes and services, quality of life … the issues that the county more directly deals with than at the state and federal level,” he said. Over the past year, several major Republican figures in the county were caught up in legal issues. Former Nassau County Executive Edward Mangano is going through the process of a retrial over whether he accepted gifts in exchange for contracts from a wealthy restaurateur (Town of Oyster Bay Supervisor John Venditto was found not guilty on similar charges in May). Mangano’s chief deputy, Rob Walker, is due to appear in court over accusations of making false statements and obstructing justice over a bribe. Last month, former Senate Majority Leader Dean Skelos (R-Rockville Centre) was sentenced to four years and three months in prison for using his position to secure money and jobs for his son. But Cairo felt these scandals did not hurt the Republican Party in any significant way this election cycle. “Corruption is always an issue, but you had the former speaker of the Assembly [Democrat Sheldon Silver] and people close to the governor [Andrew Cuomo] going to prison, so I think that went both ways,” he said. Another thing that was not a problem was the candidates, he said. “I think we had proven candidates, like [state Sen.] Kemp Hannon who championed health issues but was defeated,” he said.